Home » Social Media Marketing » How Much Do Influencers Really Matter in Social Media? A recent excellent Harvard Business Review article pointed out the dangers of relying on social media data as proof of social media influence. What Would Ashton Do—and Does It Matter? In his article, Sinan Aral points out the simple fact that people don’t live inside social media silos. We live in the real world, where many more factors than social media “influence” our purchasing behavior. If HBR is correct, then the “social media influence” we are measuring right now is not necessarily the result of one person actively influencing another’s behavior through social media (whatever that means). In other words, a lot of that “influenced behavior” was gonna happen, anyway. The implication: if you want to measure the true influence of your social media outreach on purchase behavior, then you need a more sophisticated model than a Klout score or number of followers provides. Looking for inspiration on how to measure true influence in social media? 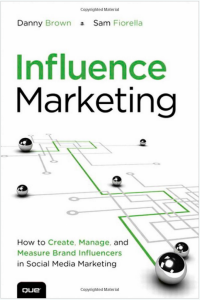 Danny Brown and Sam Fiorella co-authored a book, Influence Marketing, that does a great job outlining the complexities involved and proposes a new model for influencer marketing.